Soaring rental costs and hefty deposits are causing financial struggle for Britons who find themselves locked out of home ownership; they are forced to ration their heating and food just to cope, a new survey reveals. The research, carried out by the National Housing Federation (NHF), suggests Britain’s rising rents are making life extremely hard for those who are unable to get on the property ladder. The organization, which represents a diverse network of England’s housing associations, surveyed a total of 1,183 tenants across the country as part of its research. Some 41 percent of private tenants with kids had struggled to meet their rental costs on at least one occasion, while 31 percent of general tenants have had the same experience. Over 25 percent of families surveyed said they economized on their weekly grocery shop, and almost a quarter suggested they had to cut back on their heating usage. Britain’s heavily inflated property prices, a result of stricter mortgage lending policies, have created a situation where more people are locked out of homeownership. 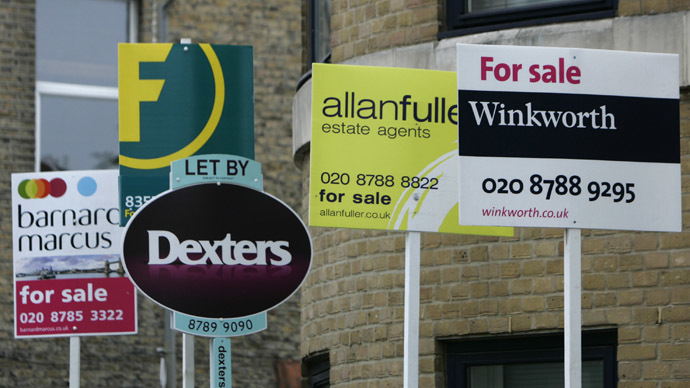 England is faced with the highest number of private tenants since 1974. In turn, rising levels of demand for rented accommodation has further hiked rental costs. While Britain’s poorest people struggle to heat their homes and eat well amid rising rent prices, they also pay a higher proportion of their gross income on tax than the state’s most affluent residents. On Monday, a sobering report revealed the poorest 10 percent of British households dole out almost 50 percent of their gross income on tax. By contrast, Britain’s wealthiest 10 percent of households pay roughly 35 percent of their gross income on tax. Leading UK letting agents, Your Move and Reeds Rains, suggest private rental costs fell on average last month across England and Wales. But this trend was not replicated in London, East England and the East Midlands where tenants are paying more than ever. In London, the average monthly rental cost is estimated to be £1,167. The NHF’s research indicates the financial pressure created by hiked up rents results in considerable emotional stress and anxiety for those who are locked out of homeownership. Some 31 percent said they feared further increases in their rent, while 15 percent acknowledged they had experienced anxiety or stress regarding soaring rents in the last year. The organization concluded the government must offer greater levels of affordable housing to families on low and average incomes. “We have too many renters just keeping their heads above water, who are being kept awake at night and suffering from stress over the worry of paying the next rent bill,” David Orr, the group’s chief executive, told the Guardian. Orr argued the government’s current strategy for dealing with the crisis was short-sighted, inadequate, and required a dramatic overhaul. The provision of affordable housing to those who are priced out of the property market and struggling with climbing rental prices, however, is not currently a priority for the government. The most recent statistics from the Department for Communities and Local Government indicate that a mere 43,000 affordable homes were constructed in England in March 2013-2014 – the lowest number in eight years. Instead, more and more homes are being constructed as “affordable rented housing,” which can be let out to tenants for as much as 80 percent of already ramped-up market rates. Soaring rents imposed by private landlords, particularly in London and southeast England, are pushing millions of non-homeowners into poverty – and forcing many ordinary citizens out of London. Following the introduction of the government’s benefit cap earlier this year, increasing numbers of Britons are struggling to cover their rent. The benefit cap ensures that the state will only allocate a maximum of £500 to families in any given week towards rent and housing costs. For families located in London and other high-rent regions of the UK, this austerity measure has placed social housing beyond the means of many. Experts warn the draconian policy is effectively “cleansing” London of its least affluent residents.